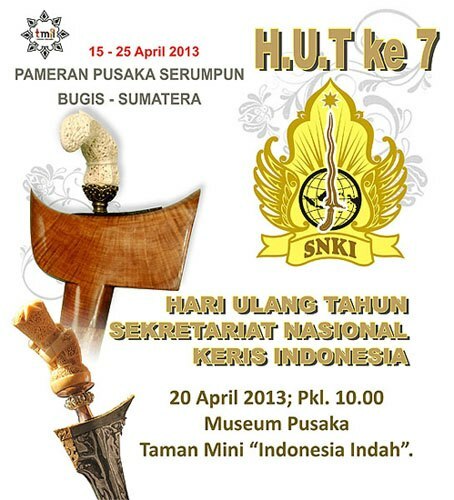 The Indonesian National Keris Secretary (‘Sekretariat Nasional Perkerisan Indonesia’; SNKI) will be celebrating their seventh anniversary on 20 April 2013. This event will take place during the ten days national exhibition for Buginese and Sumateran pusaka heirloom kerises, which will be held from 15 until 25 April 2013 in the Museum Pusaka at Taman Mini, Jakarta, Indonesia. The board of SNKI and the management staff of the Museum Pusaka would hereby like to invite you to come and visit the pusaka exhibition in Taman Mini, as well as joining the public celebration of the seventh anniversary of the SNKI. So, feel free to contact us if you would like to inquire more information, or if you want to make an request for an official invitation.